It has become a right of passage. Just about every course, tutorial and book will begin with the ubiquitous Hello World phase. "So let's start with a simple Hello World console application, Hello World WinForm, Hello World custom control, Hello World Silverlight Application, Hello World WCF service .." and so on. 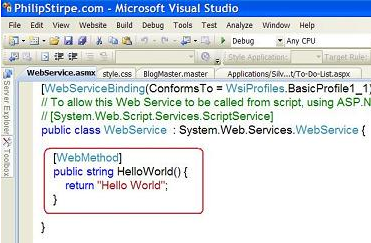 In fact, when adding a web service to your ASP.NET project in Visual Studio, guess what they call the starter method ? Now I have been in ( not into) IT for over 20 years. I started as a developer programming in Basic. There was a brief time spent with COBOL followed by some 4GLs including one called Sensible Solution. In time, I moved on to C and then C++ and finally things got a little 'Visual'. I used every version of Visual Basic through to Version 6.0. Finally there was .NET. However. This isn't a language. It was a whole new bunch of languages, libraries and tools. C#, VB.NET, ADO.NET, ASP.NET, WPF, WCF, WF and most recently Silverlight. Every one of them has tried to get me to write Hello World. Well I have a confession to make. I have NEVER written a Hello World application. Ever! Even the first time I was invited to try, all those years ago. Live Aid a recent memory. I resisted. I think even then, I had a sense that everyone on the planet who had read that chapter of the manual had written the code exactly as printed and I felt uncomfortable about playing 'Simon Says'. There have been times when I conceded to Howdy Pardner but that was only as a gag when delivering a demo. In fact. I am proud of this little foible / eccentricity. I have others you know. Books. I don't buy as many technical books as I used to because the web is such a rich source of information. However there are times when the whole subject has been put down in one place with care, narrative, structure and not too many typos. So why not simply buy a book and cut down on the surfing? Ah. But what book to choose? Well, if the author is known to you, that might well help make up your mind. Covers too must play a part. O'Reilly are always putting attractive line drawings on their covers that are easy on the eye. Although I am not sure what they are supposed to say about the contents. Just as those recruiting a new member to their team might identify a criteria that will easily eliminate half of the candidates so there are fewer to interview, for example "must have MCT, MCSD, MCTS, MCDBA, play wargames, good with livestock AND speak Italian!". So I have a simple criteria that I apply when vetting potential books from a group of unknown authors. If the author is photographed cupping her/his chin on the cover then sorry, I don't want to read the book. It's just so cheesy ! The 'Chin Shot' is the Hello World of studio photography. I have just realised that with the exception of the early 80's when I was a keen New Romantic, I am not one for following trends. Rest assured, should I ever write a book, there will be no Hello World applications or Chin Shots for me. Come to think of it, I am not into Line Dancing or 'must have' gadgets either. Now does that make me an individual and my own man, or simply grumpy, pedantic and idiosyncratic? That's enough self analysis for one day. Here is a video that I discovered today whilst organising my files. I created this on a whim, Christmas day 2007 whilst my son was animating with World of Warcraft model viewer. I figured "If it's good enough for him...."
I had been practicing several techniques with Expression Blend for creating button controls. Although the technique show in the video isn't one I would use for creating a reusable control in Blend, it does show off several features in Blend. The approach I took was a little extreme. Rather than the 'Phil does voice over whilst doing the demo' approach, I simply recorded myself performing the tasks. I then loaded that video into Blend and created a story board that animated five copies of the same video. The central video is moved around so that the eye can follow what I I am doing. I actually created the effects using Expression Blend September Preview which is pretty outdated. The current offering is Blend 2 sp1. However, everything shown in the video is pretty mush as it is in the current version. Finally, to jazz it up a little, I added a soundtrack. I had designers in mind when I created this video because I have found that they focus more on the visual. In fact of those I have shown this video too, the designers do indeed prefer it more than developers who tend to like the typical voice over approach as the narrator is often able to go into more detail. I do intend to do some "proper" tutorials (with voice over) that cover the creation of Custom and User controls for Silverlight and WPF in Expression Blend and Visual Studio. But that's for another day. Interested in Expression Blend training?